Preheat the oven to 180°C, gas mark 4. Pat the gammon dry with kitchen paper. Using the tip of a sharp knife, make deep slashes across the skin then place in a roasting tin. Arrange the carrots, potatoes and beetroot around the gammon. Tuck in the rosemary sprigs and drizzle the vegetables with the olive oil. 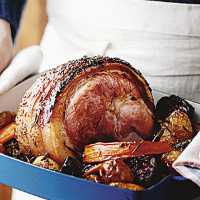 Roast the gammon and vegetables in the oven for 1 hour. Mix the honey and mustard, and brush over the gammon. Return to the oven and roast for a further 40 minutes, basting the gammon once with the honey and mustard. Take the roasting dish out of the oven and transfer the gammon to a board. Cover in foil, and allow to stand for 10 minutes before carving. Slice the joint thinly and serve with the vegetables. Serve generous slices of leftover gammon in sandwiches with granary bread, lettuce, sliced tomatoes and a smear of mustard.